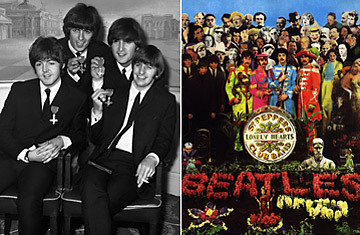 Rolling Stone called The Beatles' 1967 album, Sgt. Pepper's Lonely Hearts Club Band, the "most important rock-and-roll album ever made." It signaled a break, both figuratively and literally, from the Beatles' previous work. Frustrated by the trappings of fame, the band assumed this alter ego so it could have the "freedom" to experiment. The result was some of the group's most enduring songs, from "Lucy in the Sky with Diamonds" to "When I'm Sixty-Four" and "Getting Better." Though the act didn't stick, the album cover's re-imagining of the band remains one of the classic images of music's most famous quartet. Read "Did the Beatles Destroy Rock 'n' Roll?"